Not going to sit here and complain about how 1809 deleted my user files (it didn't), or how it destroyed my activation key (it didn't). My post here serves as more of a usability issue - a functionality glitch that someone at Microsoft might have missed. Losing Edge wasn't such a big deal. Losing the Store and half my users lost their minds. Some wanted the subsystem for Linux which stupidly requires the Microsoft Store to download and install - lame, Microsoft, very lame. Some other users encountered some 'printer' issues that required the store to download the latest driver set and application (HP) - that is lame too. But with the latest update to version 1809 of Windows 10, the LTSB nomenclature was changed to LTSC (B for branch in the former, and C for channel in the latter). With this update, we got the essential 1809 code update, but still lacking in those two areas mentioned above. See the issue here.. You need the MS-WINDOWS-STORE to open the Microsoft Store, but it isn't installed. There are little issues like this all over the updated OS. 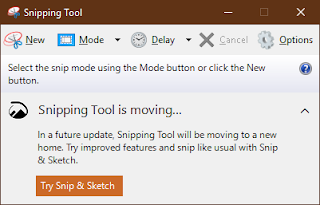 I use this tool a lot in my daily activity and now I am prompted to move to SNIP & SKETCH (a better version of the snipping tool). The problem is, you click the TRY button and it states that you need the app MS-SCREENSKETCH which you can only get from... drumroll please... the Windows App Store. See the issue here. 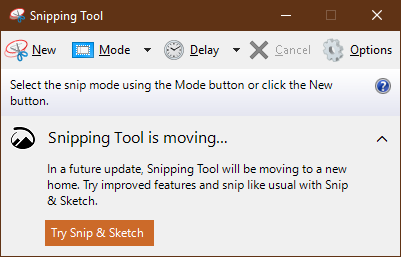 It is as if Microsoft Engineers were simply too lazy to remove these items that now taunt you to go to the Store or Try this new App or update your Themes (btw - none of these UI issues were present in the 2016 LTSB version we are running here... only the 2019 LTSC). Microsoft - please take a bit more time to discern which OS you are programming for and 'hide' these elements so people aren't taunted for the next 3 years.